On this post we are not going to give you advice, nor are we going to present you Ways that will take you to the Apostle’s grave. Instead, we’re going to talk about the figures related to one of the most important pilgrimages in the world. 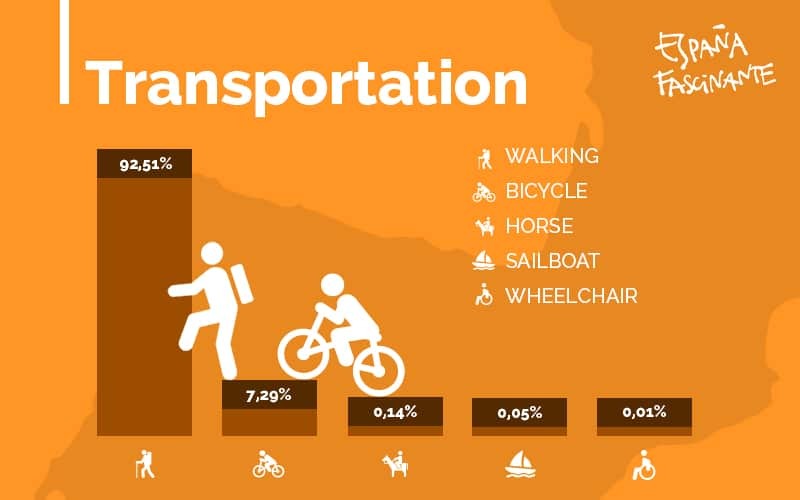 Statistics represent real people and reveal several facts about the Way to Santiago, providing us with a different point of view. Our analysis will be based off a report from 2017, the Informe Estadístico de la Oficina del Peregrino, which includes relevant Way to Santiago statistics. We have to start talking about the pilgrims, the real Way makers. In the first centuries of the peregrination to Santiago, most of the walkers were men, but nowadays things have changed: pilgrims are almost 50% women, 50% men. The statistics are updated every year, and in 2017 there was only a difference of 1,76% between both. Would you be able to guess the average pilgrim age? You might be thinking that young people and teenagers are the first on the list. Well, think again! 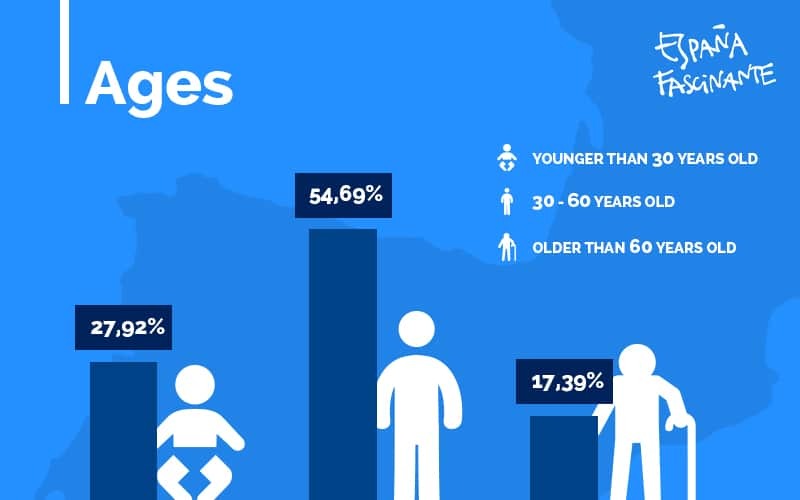 Turns out that 54,69% of the pilgrims are between 30 and 60 years old. Elderly people are also part of the stadistics. This proves that there is no age limit to do the Way to Santiago. In the case of the elderly, the percentage is more than 16%. Europe is the predominant continent in the Way to Santiago. Logically, Spain is on the top in number of pilgrims, with 44,01%. The Andalucians are the most involved: more than 27,000 walkers completed the route in 2017. The next four regions in number of pilgrims are Madrid, Comunidad Valenciana, Cataluña and Galicia. Below Spain, and with an important difference, appear the other countries that contribute with pilgrims. The first ones are European: Italy, Germany, Portugal, France, Ireland and England. This could be due to the geographic proximity and cultural similarities, as the pilgrimage is an element rooted in European culture and religion. Nevertheless, there is a country that sneaks between the first ones, and it’s the USA, with 5,82% of the total. 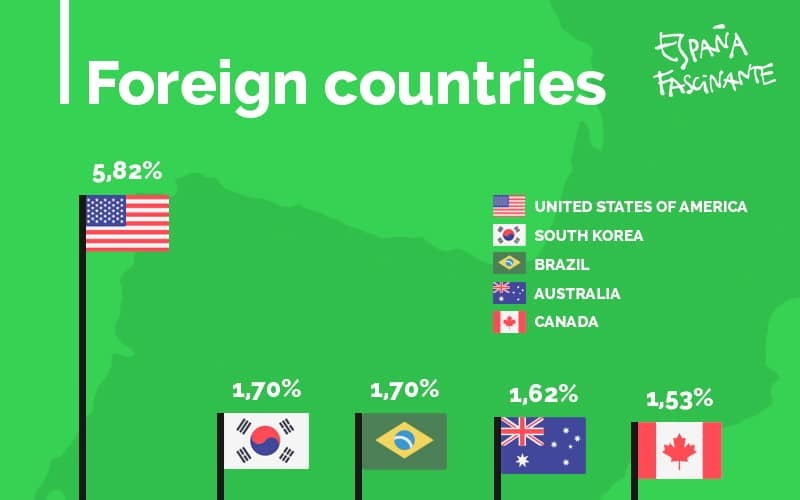 This country is followed by South Corea, Brasil, Australia and Canada. None of the last four exceed 2% of the pilgrims. There are also less known countries like Tonga, Aruba, New Caledonia or Comores. This numbers are proof of the universality of the Way to Compostela, a route that’s become an encounter of cultures and emotions. Walking, by bike or by horse? 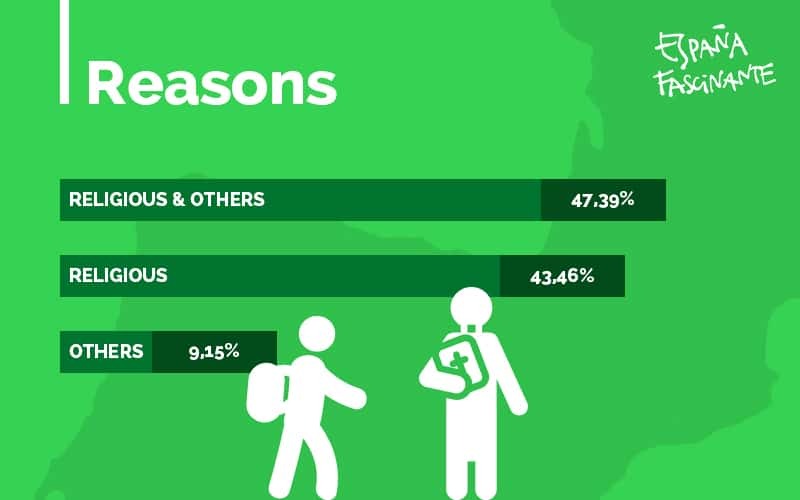 Generally, pilgrims prefer to walking. The difference is important: it suppose the 92,51% of the total percentage, in the statistics of the Oficina del Peregrino. In the transport is also recognized the sailing and the wheelchair. Other interesting Way to Santiago stadistics refer to the reasons why people decide to do the pilgrimage. In the graphic, we can see that religious motives are the main ones. The route to Santiago started with the veneration of the saint relics, therefore the essence is still maintained. Nevertheless, as the Way has gotten more popular throughout the years, active tourism, leisure and new experiences are other reasons that have prompted people to start walking. The French Way is the leader. 60,04% of the total walkers did this way in 2017. 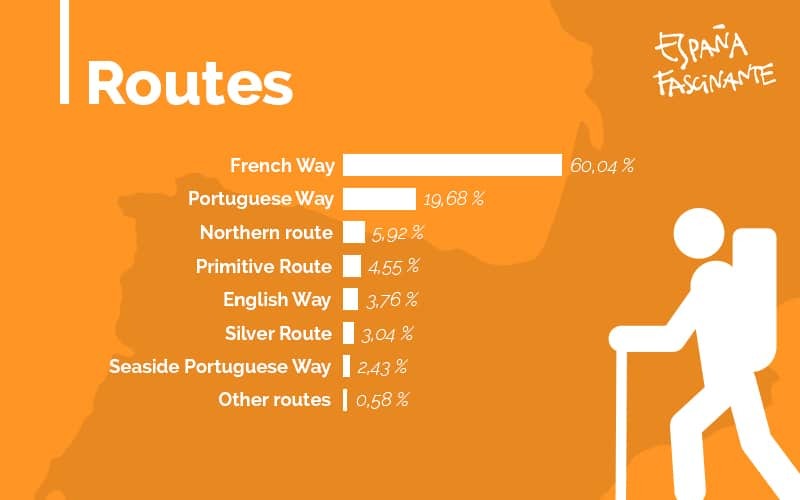 The next most popular route is the Portuguese Way, with 19,68%, followed by the Northern Way, Primitive Way, English Way, the Silver Route and the Portuguese Way by the Coast. From these figures, we may analize the quantity of pilgrims, the route’s afluence or the people nationalities that you can find along the Way. These statistics prove that the jacobean route it’s still one of the most popular vital experiences in the world.